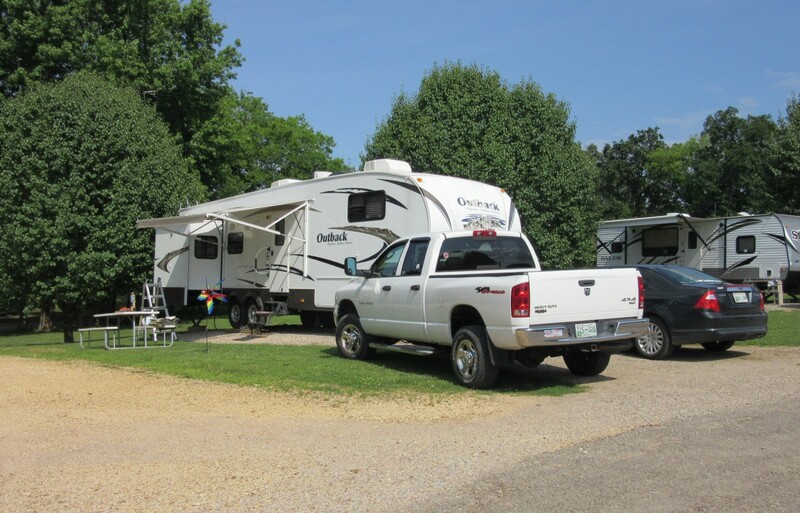 Jim and I found Green Acres RV Resort Park online, and decided to stay here because of its great reviews while we checked out other RV campgrounds in a 50-mile radius of Corinth, Mississippi, where Jim is working. It did not take us but two or three weeks of looking around to realize we had lucked into the best RV park in the area, so even though Jim has about a 40-minute commute each way, we’ve chosen to stay here. The down side is there is no real need to move the 5th Wheel for almost a year and a half. We both were concerned that we might “forget” how to break camp, move, and set up camp again. Also, as Jim pointed out, it gives us a chance to check everything (slides, tires, brakes, etc.). Both of these issues are valid points for moving periodically, but the last couple of days, the idea of all of the “work” that goes into moving, especially after being settled for a couple of months, just did not sound appealing, but we eased into the preparations for our big moving day. While our move was little (we only moved from one site to another site in the same park), it was also big because we had to prepare for the move in the same way we would prepare if we were going to drive 500 miles (though I hope we never have to go that far in one day). Here is a picture of site 18, our home for the last 2 months. This shot shows the distance between our previous site (18) and the site into which we have moved (15). Sites 17 (empty) and 16 are between as is a gravel road. Site 15 had a pop-up camper in it until this morning. This picture is of our new site; we are still getting settled in our new spot, but we’re functional. 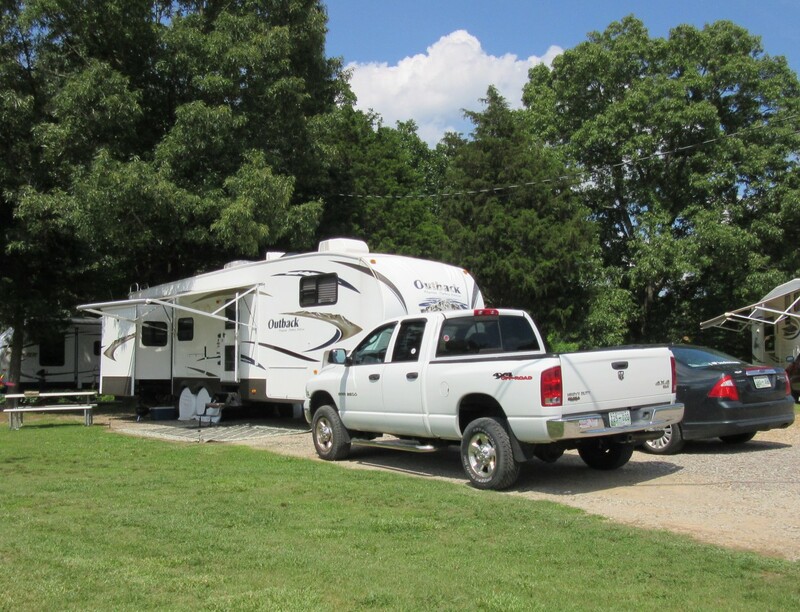 Of course, our moving day was one of the hottest days of the year so far, but it was a good call as we found a couple of small issues on the camper that need to be addressed before we are ready to make a long-haul move. One of the funniest things that happened today was when Jim was checking the slide tops before pulling them in. We’d had a lot of rain while here, and he did not realize there was as much standing water on the awning of our longest slide. 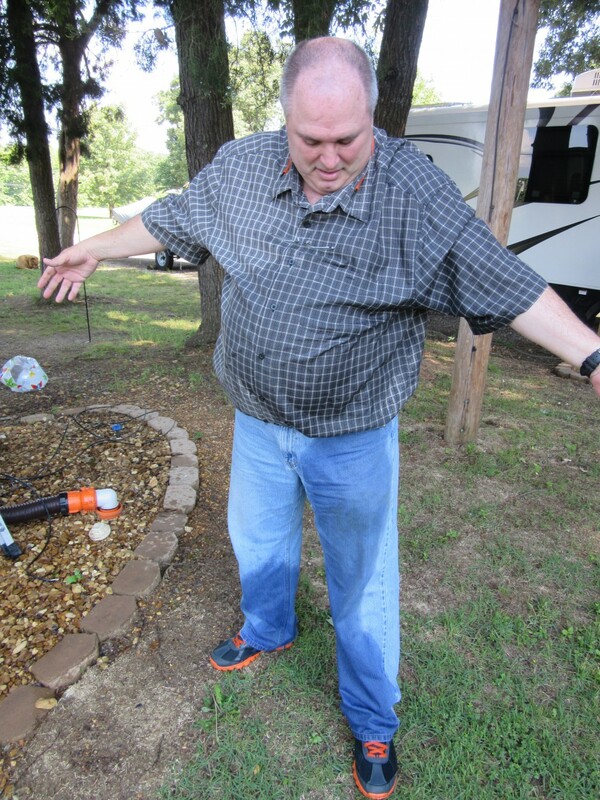 Because of this, he took a stinky shower. 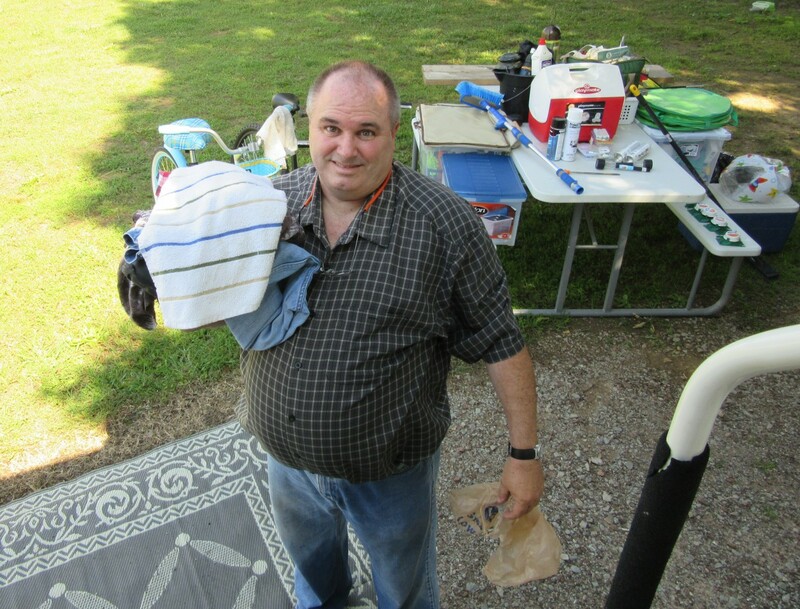 I had to crawl over the bed, since the bedroom slide was in, and get him another whole set of clothes and other shoes, so he could go to the camp restroom to change. 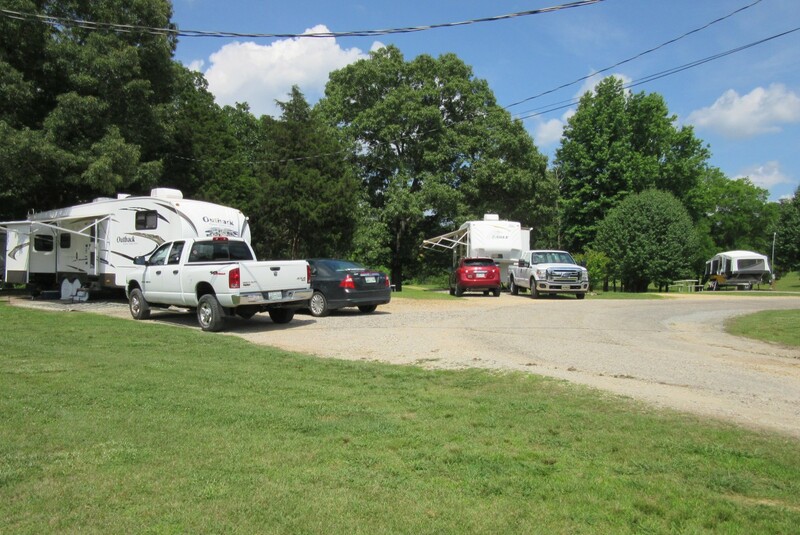 Has anyone else changed sites inside the same RV park simply because you didn’t want to stay too long in the same spot and forget how to move and to also check to make sure everything is working as it should?